I've started -- actually I'm 2/3 done with -- the edging for the Highland triangle shawl. I stopped by my LYS and bought a new set of short, straight needles to use on the edging. I figured the cable on the circular ones would become annoying knitting just 9 stitches (at the most). 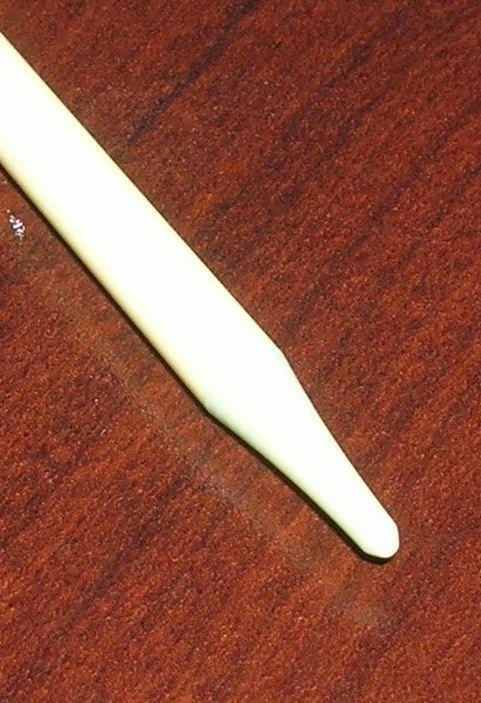 The LYS owner recommended Balene straight needles from Boye. Here is the point close up. I like it. These needles have a certain flexiblility that I've never had in needles before. 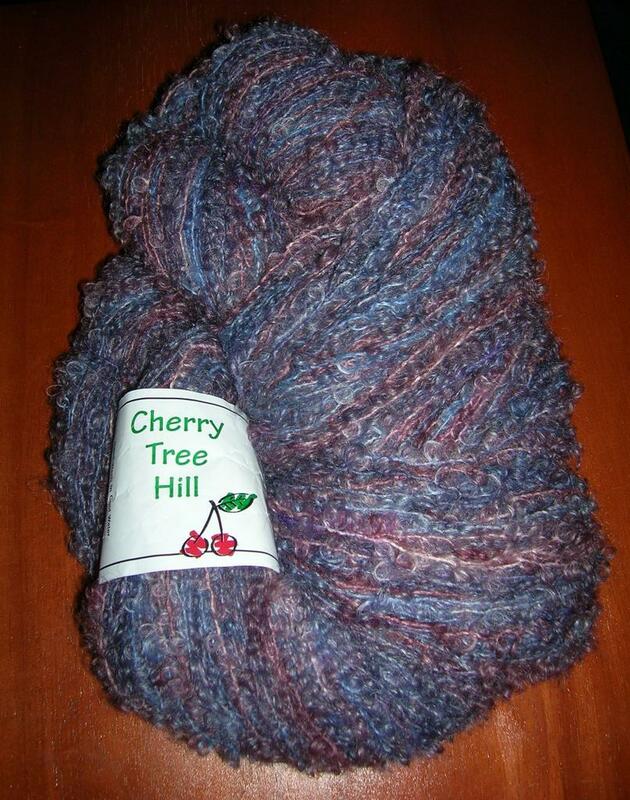 While at my LYS shop today, I bought a skein of Cherry Tree Hill yarn. It is froth in colorway water. It is a "boucle blend of mohair and a touch of wool worsted weight with a put up of 8 oz / 650 yards. 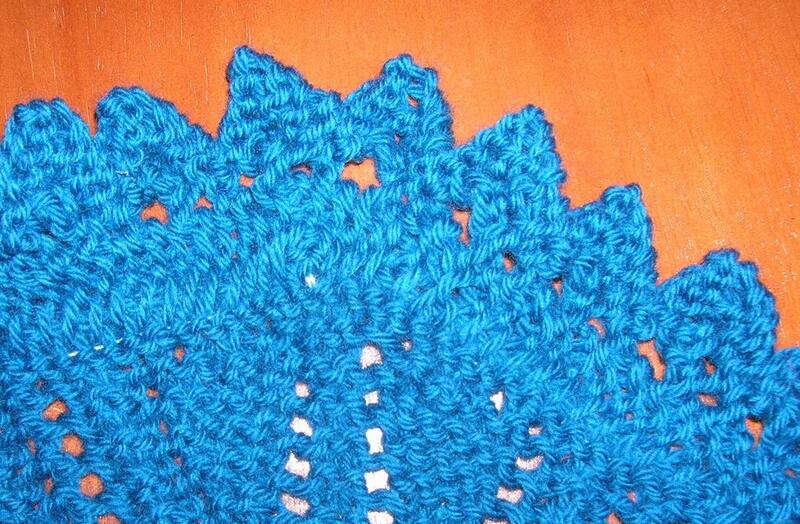 Gauge: 13 st to 3" on size 7 needles." 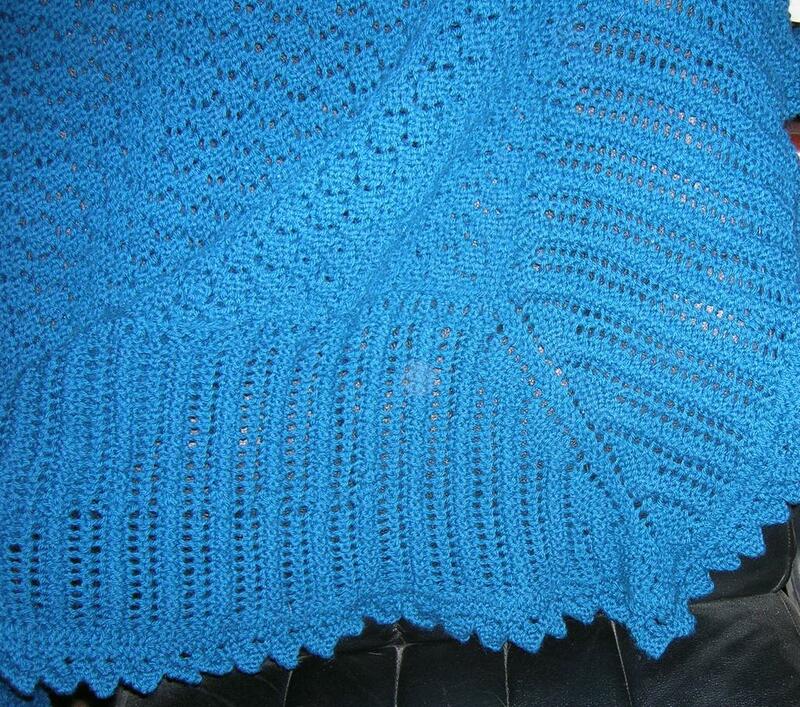 She had used in in a garter stitch wrap that I want to try. No really interesting pictures to post. Everything just keeps getting bigger. 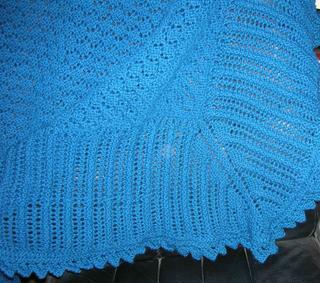 I have three more rows on the inner boarder of the Highland Triangle Shawl. I think I'm going to like this one. Have you noticed that if you are working on more than one project, that it seems like FOREVER until you finish one? 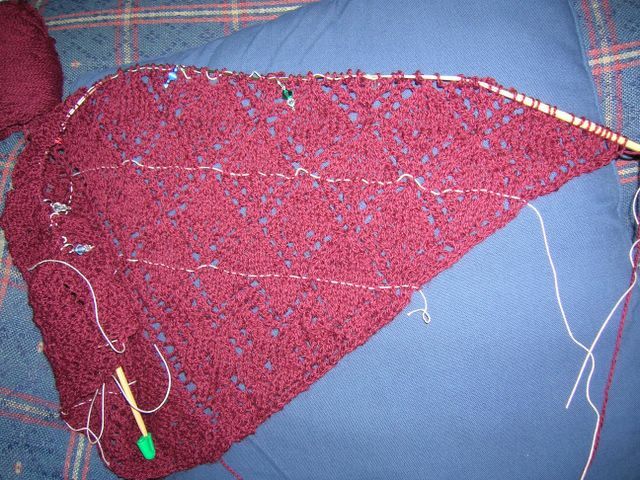 I've put aside the Mystery Shawl until I can finish the Highland Triangle -- time to focus. The Edgar scarf is my "knit at lunch" knitting and my "knit during my son's tennis game" knitting. Highland stays at home for TV knitting. She's getting awfully large to travel. I'm working on a web page to parallel this blog. 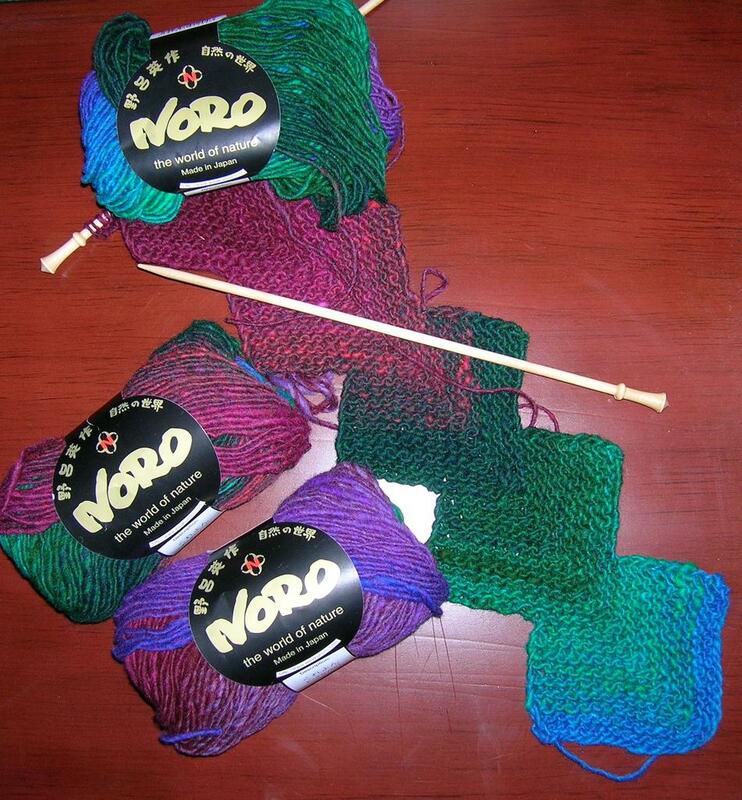 Two projects are already detailed on the web page -- clapotis and branching out. You can reach them from the sidebar. I really like finding information on projects on the web, so I thought I would add my 2 cents worth. I've also applied to the Knitting Scientists Blog Ring. It looks interesting. I'm a Research Associate in a diabetes research lab. Sometimes I think knitting and scientific thought are different parts of the brain, but I like the dichotomy. Life at work is kind of busy right now -- we're putting together an NIH grant -- due October 1. I can't wait until October 2. A year ago we were in Lisbon, Portugal for the International Congress on Endocrinology, so I thought I would share a photo to commemorate the trip. 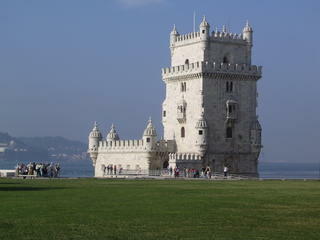 This is the Tower of Belem. I've added word verification to the comments section to help control the spamming that takes place when an update is posted. I don't get many real commentors; I hope this doesn't inconvenience the few that do get. I'm a little tired of deleting the spam, though. Thanks for understanding. The new Knitty is out. I've placed a botton on the sidebar in case you want to go check it out. 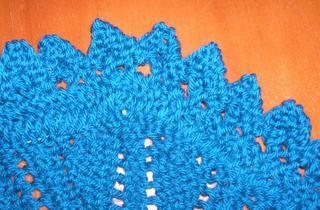 So far I've used Knitty patterns to make the Clapotis and Branching Out. This time I like a few patterns. I chose to do Edgar. It seemed like it would make nice and quick Christmas presents. I think that Ella would be an interesting pattern, but I don't think I would want to do it without a chart. What a complicated LOOKING pattern. I love the Samus sweater -- maybe someday. I also thought that the article about plying was very informative. Check that out! 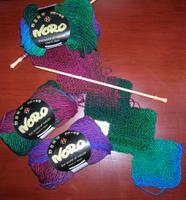 So, with Edgar in mind, I bought some Noro Kureyon, color 159 at The Stitche Niche in Lexington. It is described as brick / green / purple / blue, and that is about right. I find the yarn to be a little rough, and sometimes unevenly spun, but it is fun to watch the color change as I knit with it. Here is one yarn review (I think I like it better than Allison does in this review -- I haven't noticed any smell to the yarn at all.) I bet I would like this yarn better if I were going to felt it -- I bet it would make a great felted fabric. Oh, and I'm using my Brittany needles from Myrtle Beach. I like them for this pattern. The pattern reminds me of short row knitting, but it's not. The repeat is very simple and easily memorized. Great car knitting. Great lunch knitting. The scarf is a little narrow for my taste -- actually I like it, but I'm wondering if the intended recipient would like a scarf this narrow. How about some more stitch markers. These are addictive. I'll never use all of these markers. 1. Contribute to the Red Cross. If you do, also check out the Give a Little Blog that Margene and Susan have established as a motivation. 2. Contribute to UMCOR -- the United Methodist Committee on Relief. I'm a Methodist, and this very well-respected relief organization holds a special place in my heart. I think that knitters are a generous bunch. Here is an opportunity to show how much. Psalm 57:1 -- Be merciful to me, O God, be merciful to me, for in you my soul takes refuge; in the shadow of your wings I will take refuge, until the destroying storms pass by.